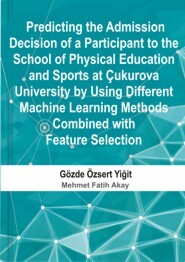 The purpose of this thesis is to develop new hybrid admission decision prediction models by using different machine learning methods including Support Vector Machines (SVM), Multilayer Perceptron (MLP), Radial Basis Function (RBF) Network, TreeBoost (TB) and K-Means Clustering (KMC) combined with feature selection algorithms to investigate the effect of the predictor variables on the admission decision of a candidate to the School of Physical Education and Sports at Cukurova University. Three feature selection algorithms including Relief-F, F-Score and Correlation-based Feature Selection (CFS) have been considered. Experiments have been conducted on the datasets, which contain data of participants who applied to the School in 2006 and 2007. The datasets have been randomly split into training and test sets using 10-fold cross validation as well as different percentage ratios. The performance of the prediction models for the datasets has been assessed using classification accuracy, specificity, sensitivity, positive predictive value (PPV) and negative predictive value (NPV). The results show that a decrease in the number of predictor variables in the prediction models usually leads to a parallel decrease in classification accuracy.